George W Hopkinson, for many years a resident of Epping, died late Sunday evening at his residence on Water street, aged 86 years. He was born in [Edenfield] England, but was brought to Epping at the age of two years. At the age of 15 he enlisted in the Union Army and served throughout the Civil war with distinction. As he is next to the oldest person in town and the last Civil war veteran in town, in fact one of the last in Rockingham county, a military funeral will be held Thursday, under the auspices of Richard A Mitchell post, American Legion. He was the last member of Moses N Collins post, GAR, of Exeter. He is survived by a daughter, Mrs Roy Moulton of Hollis, Me, and a daughter, Miss Mary Hopkinson of this town. 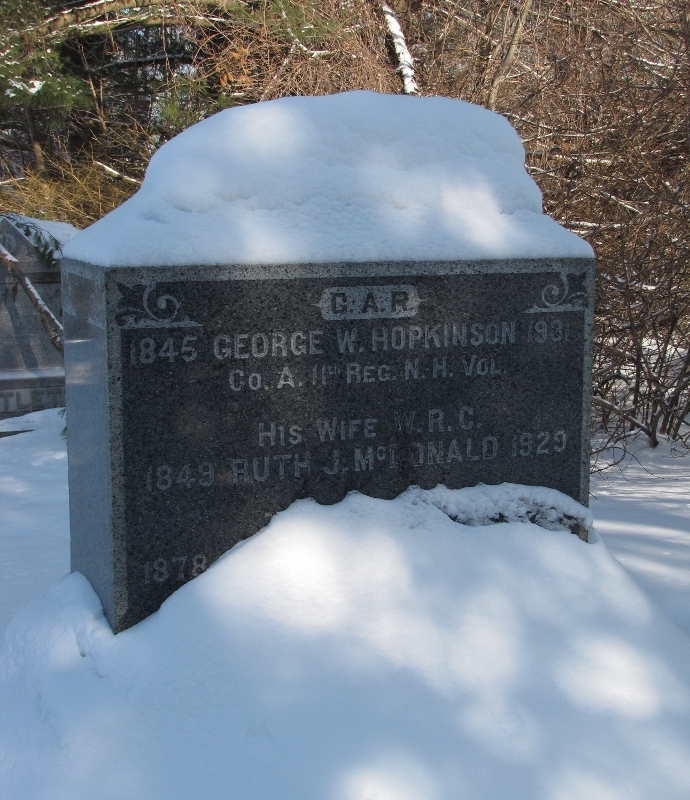 George enlisted from Epping on 11 Aug 1862 and was mustered in on the 28th with Company A, 11th NH Infantry. He was transferred into the 32nd Co., 2nd Batt'n, US Veteran Reserve Corps (formerly the Invalid Corps) on 30 Sept 1863, and was mustered out on 28 Aug 1865. He is buried in Prospect Hill Cemetery, Epping.